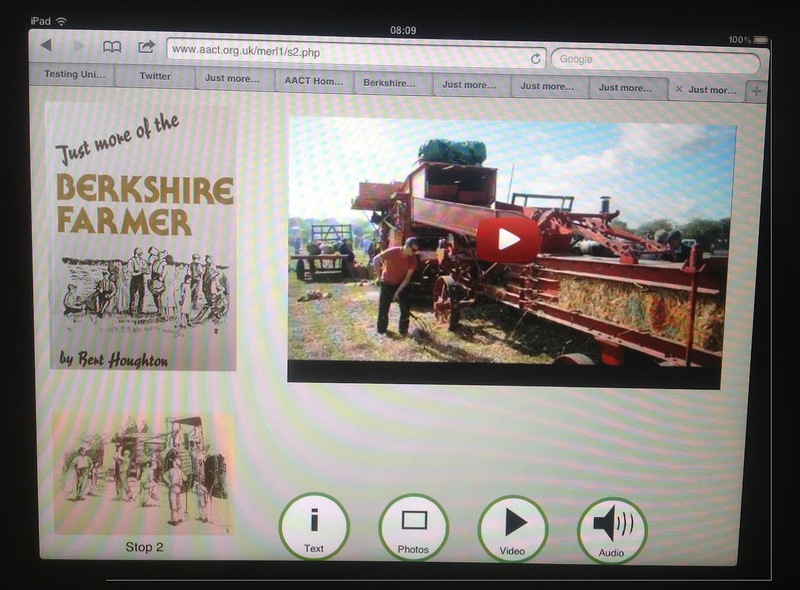 A PGCE student has done some fun presentations using Prezi. Try them out by clicking below. We'd love to know what you thought so do post a comment. Many thanks. Children are borrowing the iPads to draw and take photos (and transform them optically). We've tweeted some as an easy way to save them. Interesting that we got a drawing of a 'Tractor at Night' - good to see an understanding of modern farming techniques in an 8 year old, though the 'Farmer Pirates' treasure map was an interesting mix of themes! A family watched the video from the Amners Farm Lambing Sunday - though some turned away during the actual birth, one raised the subject of stillbirth which showed an encouraging understanding of the sometimes grim reality. MERL has a very relaxed area with toys, a rug to play on and comfortable seats. It's a natural place to sit showing stuff on mobiles like the iPads with people dipping in to look at stuff or draw or talk. Not all museums have this though. iMuse will have to think about what/whether it could do in a more formal place. Material has been gathered from the Open University's excellent Openlearn Olympics information. Our urge to try a more 'industry standards' compliant tablet is great, but we probably do not have the manpower to support another tablet, and the iPad accessibility options are otherwise good. Labels with QR codes and Widgit symbols are now tied to various objects in the Museum of English Rural Life with (soft) tape supplied by the Museum Conservator. We've started to let visitors try it for themselves on our iPad-on-a-trolley. 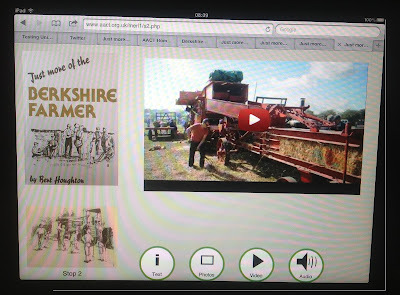 Video, especially of the thresher, was popular yesterday, as was breaking out to draw corn and 'countryside' on the iPad and take transformed photos. Maybe the trail should take the visitor straight to a video clip before offering other options? Some visitors who are not iPad-users find the concept of 'tap' [the buttons] don't 'push' (as you would with an ordinary button) difficult. Not being able to play a video as soon as a QR code is scanned (for example) is nasty and seems to be an iPad 'quirk' which has no (believable-rational) explanation. The Kiosk Pro app has been useful to run demos of the trail where no wi-fi or wireless signal is available (especially good for Country Fayre in a marquee) but of course we need a signal when, say, a Youtube video forms part of the trail. If the iPad is online, the app is not 'allowed' (?) to use the camera. Odd 'features' like this make it difficult to produce a really sound (ergonomically) 'webapp'. It may just be impossible to have a perfect solution for loaned-out iPads. The situation is different with the users' own devices of course - they will know how to tap/scroll etc and the museum will not have to worry about the visitors accessing other sites on the web - it will be up to the visitor. We have two versions of the 'app'. One for each stop on the trail, intended for use by a visitor standing in front of an object, and with access to the QR code. The other which can be used 'standalone' with arrow keys to take you from one stop to the next. Visitors to MERL's stand at Lambing Sunday, Amner's Farm, near Reading, Berkshire, UK, 29 April 2012 made their own sheep and took photos of real ones, and some very new lambs, with iMuse iPads. 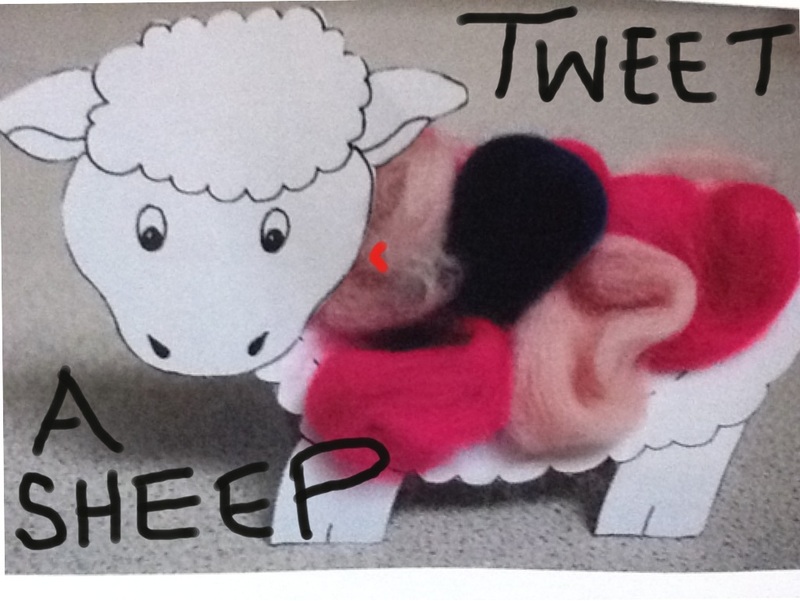 We tweeted some @imuse_programme and put them in our sheep gallery alongside other pictures from the MERL. See Tweet-a-Sheep's set of photos on Flickr. See Loren's photos of lambs here. And we made a video of a lamb being born. 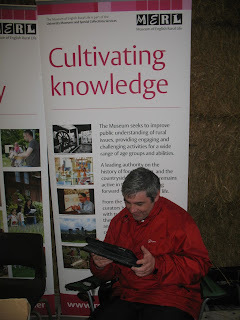 And here it is being watched - MERL and iMuse 'Cultivating knowledge'! It's Good Friday - the one day in the year that the workers in the village have as holiday. But, Chief Engineer Rab Bit and his team have to test the fire engine. Disaster strikes as Rab is walking to the village through the woods. He steps on a rabbit trap. He drops his notebook. He manages to escape but his leg is broken. He can't organise the fire engine test. His team do their best. They wheel the fire engine down to the village pond. They put one end of a hose in the water. They hold the end of the other hose up towards the trees. They start pumping. Everyone comes to watch. A great cheer goes up as the water gets to the top of the trees. The fire engine is working. But suddenly they hear a scream. Mummy Duck comes running up. Duckling is missing. One minute he was taking his first swim in the pond. The next he was nowhere to be seen. Whatever happened? And where is Duckling? Crack Reading detectives are called in to look at the evidence. Some children by the pond thought they saw something fly past. Luckily one of them has taken a video on her phone. The detectives have a good look at it. Is that Duckling zooming past? It can't be. Duckling can't fly yet. He was only just learning to swim. The detectives find out how the fire engine works. Was Duckling sucked up by the fire engine? But that should be impossible. A fire strainer on the end of the hose would have stopped anything being sucked up. They find Rab Bit's notebook where he'd dropped it by the rabbit trap. He had made a note to take the fire strainer with him. The detectives hunt for the fire strainer. It looks very new and completely unused. The detectives have discovered that the team forgot all about the fire strainer. Duckling must have been sucked up by the fire engine and shot out of the other end towards the trees. They hunted high and low. Eventually they found Duckling, looking very angry, high up in a tree. Mummy Duck was very happy. The fire team were rather embarrassed but they never forgot the fire strainer again. Chief Engineer Rab Bit was so grateful that he gave the detectives a medal and tickets to watch his favourite film, Tilley and the Fire Engines (1911). Built in 1839, the fire engine at the Museum of English Rural Life, Reading, UK was in service for over a century. It was tested on Good Fridays as that was the only day, apart from Sundays, that the people in the Norfolk village did not have to work. Testing it was a spectacle that everyone came out to view. A Chief Engineer and two other men were paid a small amount to tend the engine which was last used on a call to a privy fire in 1930. The village decided it was too expensive to keep the fire engine in the 1930s but during the Second World War it was positioned by a farm pond in case incendiary bombs hit the hay ricks. Just as we were setting-up the trail in the Museum, Fred the Conservator showed us a wonderful Huntley & Palmer biscuit tin. Dating from the 1890s, the tin depicts a steam-driven fire-engine drawn by two horses, with lively scenes of fire fighting. Fred kindly put it in the horse-vet display case near the fire-engine. Fantastic real-time museum display design! Huntley & Palmers was a central part of Reading life in the 19th and 20th centuries, and Alfred Palmer built 'East Thorpe' (Later St Andrews Hall) which now houses the Museum's extensive archives. Here the correct lodge is pinned down through its unusual decoration. 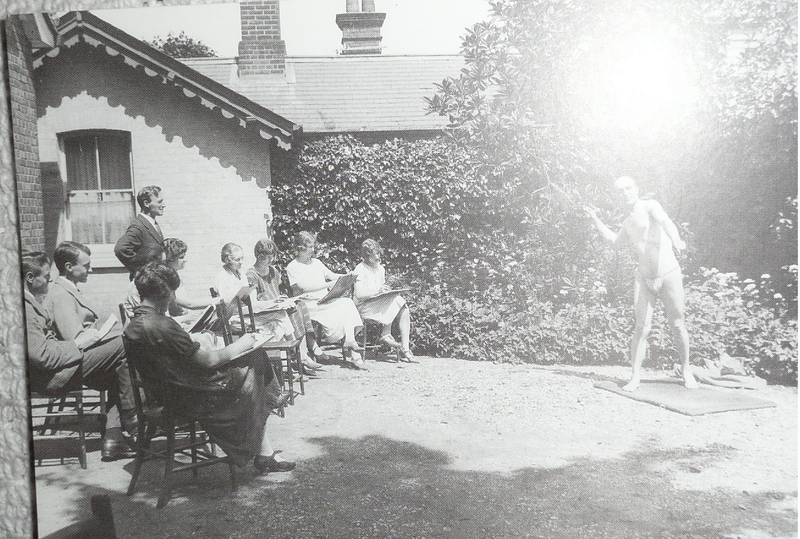 Another photo, claimed to be from Shinfield on an official University postcard (not the Museum's fault! ), was found to come from the old Dairy immediately outside the Museum building itself. Verified by counting bricks and position of drainpipes. A good mark for iMuse's heritage sleuthing if not a very glamorous task. Now we have to decide how to display - on separate exhibition boards and/or overlaid on the diagram of the new use for the site and/or on a diagram of the old site layout and/or via Flickr, Pinterest, Tumblr, Historypin. How best to arrange for display on iPads or visitors' phones? How much text/audio to add? Should we trial doing 'proper' audio descriptions? How to keep the photos for another time? What will work best in the reception area for the Sunday event? Will the University Court the next day be in the same place? How can we support the lightweight, cardboard display as the walls aren't totally flat (there's a piece of panelling on one, window halfway up on the other). For an IT based programme, iMuse people are spending a lot of time with double-sided sticky-tape and paper...here printing out the basic photos for the exhibition... and it went 3D when the iMuse trolley was delivered - flatpacked. What's imuse trying to achieve? Part 1 is at http://www.aact.org.uk/imuse.php. Here's some more thoughts. We picked up interesting ideas from Museum Computer Network conference, Atlanta, November 2011 especially from Nettrice's workshop on Alternate Reality Games - ways of encouraging visitors and museum interaction. 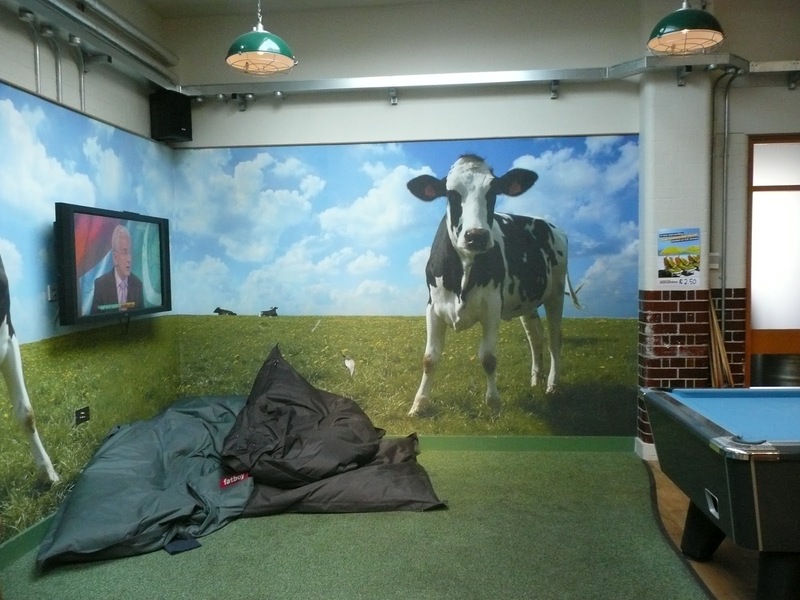 Some of those methods were used in the mini [cheese and cheesey] ARG at half-term. OK, we are working within some definite constraints. imuse is a project being run by a tiny charity - we are not ourselves a museum. The Charity's aim is to find ways that inclusion can be increased for those with communications disabilities using IT [our Charity's strapline is 'IT helping inclusion']. imuse is exploring systems that enable 'interactivity, curiosity, challenge, cooperation, choice, creativity, discovery, failure [well, and success!]' in the context of: small and moderate sized museums that don't have dedicated IT teams or much (if any) spare cash for trying new things or buying equipment. Our plan (to 1Q13) is to try out ideas in 'several' (currently defined as 'three') museums. If things look promising (i.e inclusion increased) we aim to explore the possibility for setting up a sustainable advisory service. We are an 'infrastructure' project. 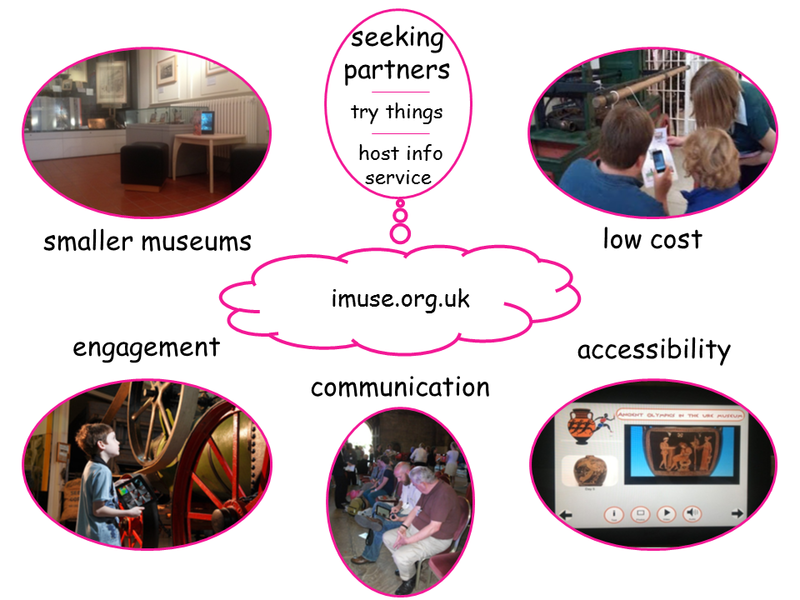 That is, we look at how museums and their visitors can put in place systems which aid inclusion, particularly using IT. It is then up to the museums and visitors how they use those systems towards their own aims. Taking the analogy for physical access, a consultant may advise a museum on where to put lifts, toilets, the height of the reception desk, space around objects. The consultant will have done a good job if more people can get into and move around the museum. Why the visitor wants to do this and why the museum wants them to do it are different matters, will change over time way after the consultant has gone and will have many facets. For example, one visitor may want to bring her grandchildren somewhere fun for a holiday outing where they can do things together, another may want to study a specific museum collection. The museum may have funding to help local schools with part of the national curriculum, or have an aim to increase volunteering. The access consultant may have been apprised of some of these at the start of his project, but cannot know them all because things change. Those outcomes are not his speciality. Getting people in and moving around is. After that it's up to visitors and the museum whether they use the systems for having fun, running a cocktail reception, formal learning, somewhere to go on a wet Sunday. As one of the project aims is to encourage people to learn more about their heritage, the project worked on creating a mini Alternate Reality Game aimed at children aged 6- 13 visiting the MERL during the February half-term. A topic was selected that incorporated the fact that the building next door to the MERL was once a dairy used by the British Dairy Institute, an associate of the old pre-university college. Objects from the Institute and the University are in the MERL, which includes a particularly extensive collection of objects related to butter-making. 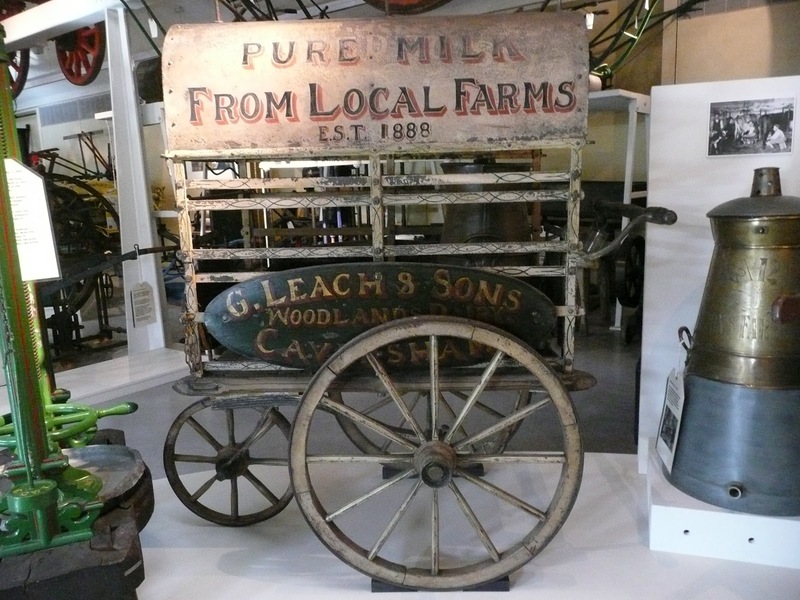 A storyline was then formed, using objects in the MERL that had local dairy connections, for example a milk float and a cheese press. 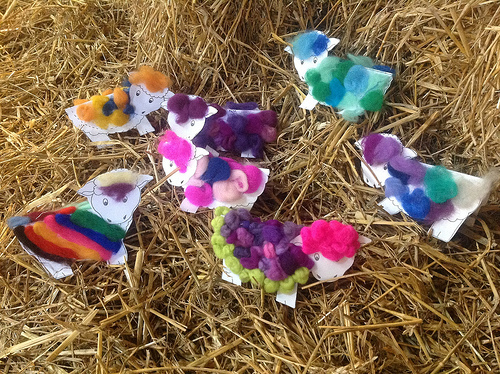 The MERL had advertised its activities for the half-term week as suitable for children aged 6+. So it was decided to aim for the same age range. The actual mystery game itself involved children coming along to the ‘forensic lab’, a table with iPads, clipboards, clues and volunteer helpers known as the ‘lab assistants’. Here the children were signed up as detectives, which involved them scanning an ID card which had a QR code on it. The cards and also later clues, were scanned via the i-nigma machine (an iPad secured in a box, on a table) to discover the child’s detective ID number. From there they were given their first clue (a slip of paper with a QR Code on), which was again scanned by the iPad to reveal the location of the next clue. At each trail stop where the clues were collected, the children were asked to answer a question about the objects nearby, which were of course related to the cheese making theme of the mystery. Each clue had to be brought back to the lab and i-nigma machine for scanning, to reveal information about the location of the following clue. The final question asked the young detectives to smell a block of smelly cheese and identify which cheese they thought it was. They were then rewarded with a certificate of appreciation for their help in solving the mystery. A local farmer, Bert Houghton, wrote some charming books in the '80s and '90s about his experiences. We were introduced to them by his step-daughter, who is the head of a special school nearby. We've now found copies of 'Not just a Berkshire Farmer' and 'Just more of the Berkshire Farmer' in the Museum of English Rural Life library, and also on Amazon (so we've splashed out). All the copies are signed by Bert which is a lovely touch. The Museum archivists have also found us the copy of Farmers' Weekly for 1975 on which a poem in the book is based. We've found some objects in the MERL that are very similar to those in some of the illustrations. We are now trying to find out who may own the rights now to both the illustrations and the text to see if we might use them in a trail around the Museum, especially for visitors who might find communication difficult for one reason or another. Amy in the Ure Museum, University of Reading, UK, has given us some terrific material for an Olympics trail. 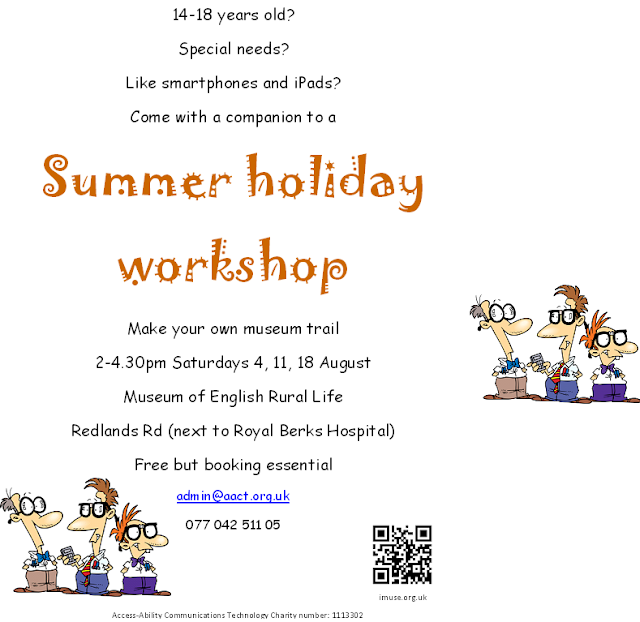 This would be in addition to their exciting work they are already doing with the Open University producing an iPhone app, and also two local schools looking at the objects in imaginative and fun ways. We think a shortish trail of a few Olympic-related objects, described in Widgit symbols and augmented by info online might be fun and useful especially for those who find reading and general communication difficult. Our current idea is to have a card printed on both sides hanging near an object. Amy has pointed out a very useful area next to each case which we might be able to fasten things to without in any way disturbing the current displays. The card would have quite sizeable dimensions - something like 7cm x 21cm - to make it easy to handle. Visitors could either use it as it is, ignoring the QR code, or could scan the code with their own phones or, for specially organised trips, with an imuse iPad box (which is designed to be specially easy to use for anyone who finds accurate use of a touch screen a bit problematic). Here's a preliminary mock-up of a card. We'd welcome comments on usability etc. Note that the symbols are copyright Widgit Symbols Ltd.
We needed a cast-iron way that visitors taking part in the game could get the 'clues' decoded. Having experienced problems with wi-fi coverage in some parts of the museum, and also found some visitors had problems with the iPad touch screen, we used an iPad box and security device to make a (very) simple prototype 'machine' to stand in one place in the museum. Holes were cut in the box to allow use of the cameras, access to the power inlet and so on. An iPad 2 was loaded with the i-nigma QR code reader app, placed inside a security shield and placed on top of the box. A small adjustment was needed - an extra 'slot' through which a torch could be shone when light levels were low. We did not use the matchbox to load clues in practice as it was fiddly and added time. Children just put the clues (which were printed on ordinary 90gm paper) into the slot which was made half an inch deep. However, some further adjustment is needed to guide the code to an exact spot. Children using the machine enjoyed 'lining up' the code with the reader's preferred area, but for more certain outcomes when used by those who might find this difficult, or who are more interested in getting the information than 'playing' with the iPad, there needs to be a guidance mechanism for the card containing the code. The iPad cover was taped to the box to prevent users slipping things down inside. 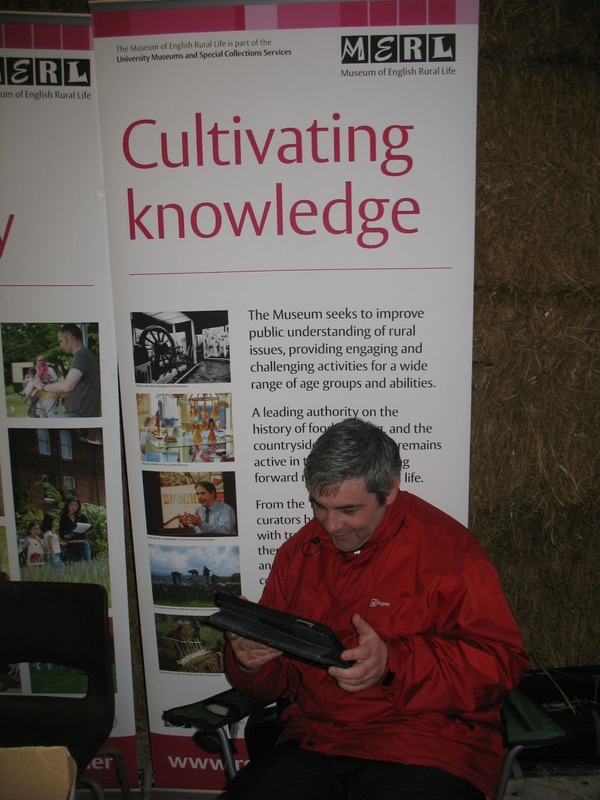 We are going to encourage visitors to bring their own iPads. A similar box onto which they can put their own iPad without fixing it permanently might be worth trying. For general use around the museum, we will also try mounting the box on a trolley. This might also get round the fears about security. Not a solution that would be feasible in a very crowded gallery, but one that might work in smaller, less densely visitor-packed museums, or for use in small tour groups. It will also help those who find carrying the iPad for any length of time difficult, and those who find it difficult to 'line up' a QR code on an object with a smartphone or iPad camera. 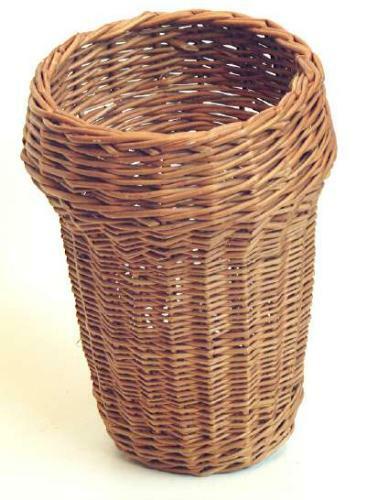 If the box proves useful we might get one made of a suitable material (wood perhaps for the Rural Life museum). It would be too intrusive to have this sort of box in many fixed places around the museum. However, it sounds as though there has been some work on doing something similar for visitors to use with their phones and we'll investigate that. It may be a way of getting round the lack of NFC (near field communication) on current generation iPhones and other smartphones and could help those who find lining up on a QR code difficult, for example because of poor hand-eye coordination or through sight-impairment. The Great Reading Cheese Mystery 'full story' can be read online (available through www.imuse.org.uk which children had on the bottom of their certificates at the end (though quite often we forgot to point this out).) The online story has been opened 35 times to date. The 'vagueness' of some clues (referred to in Rob's post, below) led to increased interaction between visitors and the imuse people manning the 'Forensic Lab'. This is a plus for a communications-charity project! It would be a minus if we wanted to have trails where the visitors could do them unaided and/or we didn't have a fairly highly manned central place visitors could go for help/discussion. Feedback from children was almost universally enthusiastic. They were given a chance to 'vote' at the end on whether it was 'fun', 'sort of OK', 'not fun' by putting the appropriate smiley face card into the i-nigma machine (the iPad). We weren't very careful about asking everyone to vote, and sometimes a vote was put in for a group rather than individually. The more adult vote ('we found out quite a bit', 'we found out a little', 'we didn't find out anything new') had even lower numbers of participants as we rather got involved in the business of cheese sniffing, hearing what people had to say and managing the certificates and the machine. Probably the place where adults found out most was at the end where there could be a discussion about Berkshire not being a traditional cheese county, but that local cheese making had a renaissance (two were named in the trail and contained local place names), that the BDI dairy was next door and now the cafe and that Reading still had a strong interest in dairying and cheese-making courses in particular. Several adults said they'd never known that and a few stayed longer to discuss further. We also had a 'ways of i-seeing' activity (to mirror the Museum's own activities with various optical devices such as kaleidoscopes) where a visitor could pick their favourite museum object, and transform it optically using the Photobooth app on an iPad 2 (securely slung around their neck). We know 8 people took part early on in this, producing some interesting results (see www.imuse.org.uk for pointer to these on Flickr) but we ran out of effort to run the two activities in parallel. We had not advertised these activities and very much benefited from being 'off the back' of the Museum's advertised activities, with people able to join-in several activities during their visit. Tuesday and Thursday had activities for 6+ advertised, and Friday for younger children. Families were very keen from the beginning, the use of an ipad is considered an exciting and surprising activity in a museum. 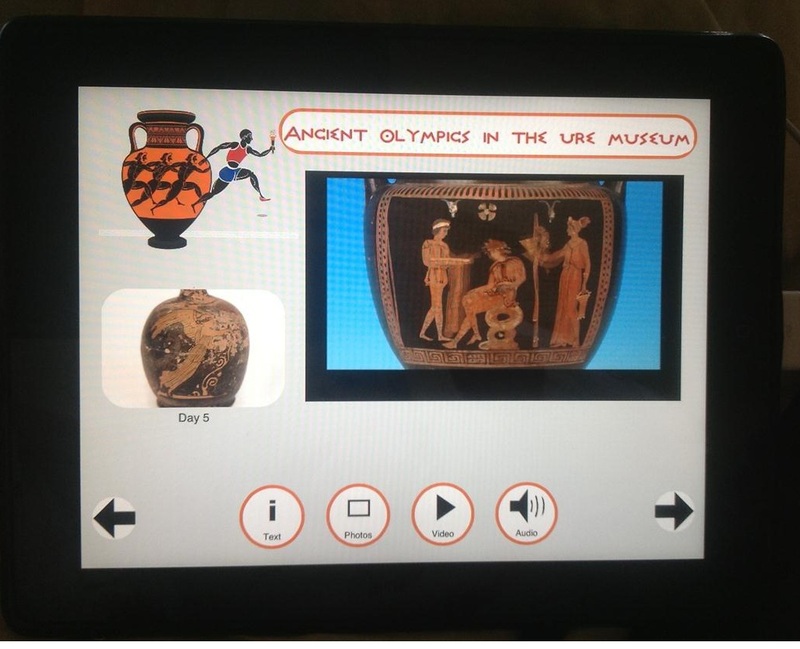 A parent said “the last thing they expected to see or use here was an ipad based activity.” Children liked having their own board and Detective ID, from the moment they could scan their ID they were very much involved. The novelty of using an ipad was maintained right throughout the game. Children enjoyed the “hunt” around the museum, finding the clues and discovering new objects such as the milk float was a great positive. Some families answered the questions and did the whole game properly; about two thirds were happy to find the objects. Two visitors used their own iphones for the clues, however at the last clue they were stumped on how to find a lab technician. The hunt around the museum also saw families split up, at times children were on their own without an adult who couldn’t keep up with them. This is something that the staff can’t do anything about, apart from stress at the beginning about keeping as a unit. During the busier moments, children were crowding round and bustling to have a go on the ipad creating congestion. On future projects, the use of two ipads would be good, this could still be manned by one person if the ipads are working correctly. Families found the clues a bit vague, they needed to be explained by the member of staff. A suggestion for the future is to have a workshop with families to create the clues. We've tried a very simple 'game' in which an object had an A4-sized label attached looking like this. The child is asked to find one of the labels in the museum, a volunteer scans the QR code with an iPad 2 and the child is asked to 'touch' whichever object they think they are looking at. 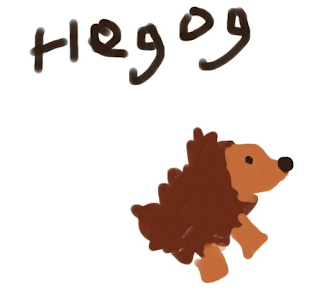 The reasons for doing this, including the use of Widgit symbols for objects can be left till later. For now this is a note to remind us of the practical problems and what we've done since. The 'game' was trialled with some under 5s (plus mothers) and also shown to some museum volunteers, a few other visitors and staff. Problems included: small fingers not 'touching' enough, 'dry(?)' fingers just not getting a response, elderly visitor with gloves on (did not feel could ask to remove), a vague 'fear' of touching the screen, response time not completely instant (child used to iPad apps). There were problems in some areas of the museum with variable wi-fi (appearing sometimes on one moment, off the next). Lining up the iPad (which was hung round the neck) with the code caused some uncertainty on occasion (possibly the non-central positioning of the camera on the iPad causes problems in alignment that don't occur with a smartphone). Shadows occasionally caused a problem. A4 sheets were hung with string from the objects. It was not always possible to get them so they didn't move/swing round or so that they were at a good height, though some of these problems were due to their temporary, experimental unplanned nature. 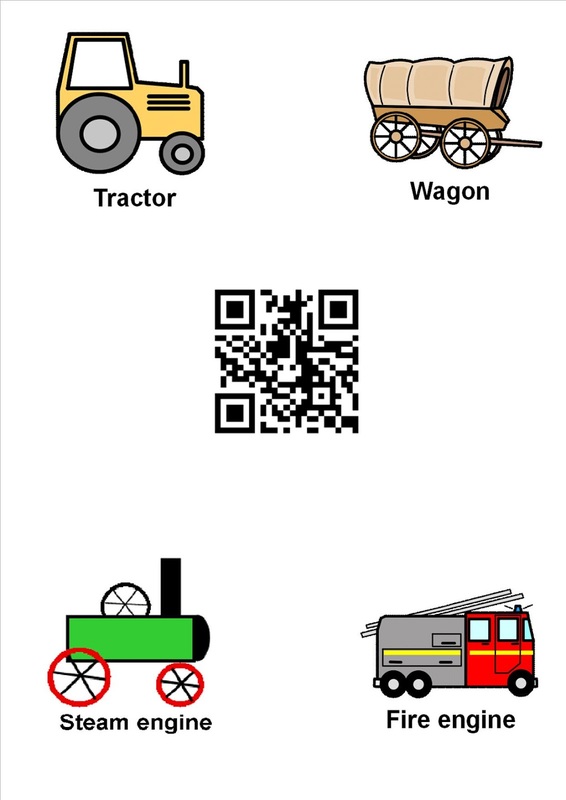 For our half-term activity (The Great Reading Cheese Mystery qv) we wanted a totally reliable way of children being able to get an iPad to 'decode' a clue which included a QR code. We therefore set up an iPad in a makeshift box, on a table with good wi-fi access. The children find a 'clue' and return to the 'lab' to have it analysed by the decoding 'machine'. So far the i-nigma QR code reader app has been found reliable and this was loaded. The iPad was set not to turn off to minimise things that 'could go wrong' though the i-nigma app would need 'resuming' if not used for some time. The child slid the clue under the iPad in a slit in the box. The iPad then revealed the analysed 'clue' (a simple wepage). Apart from one very brief spell lasting a minute or so (in which i-nigma reported server problems) the decoding has been fast enough and totally reliable over two days. On the whole, children quickly learn how to position the code to get the app to 'beep' that it had read it. Some easily learned how to go to 'home' and restart i-nigma. Children seemed to enjoy using 'the machine'. The 'machine' was movable so a child in a low wheelchair was able to use it and read the resulting clue. Children down to around 4 years old took part successfully. The machine was 'manned' by volunteers throughout. 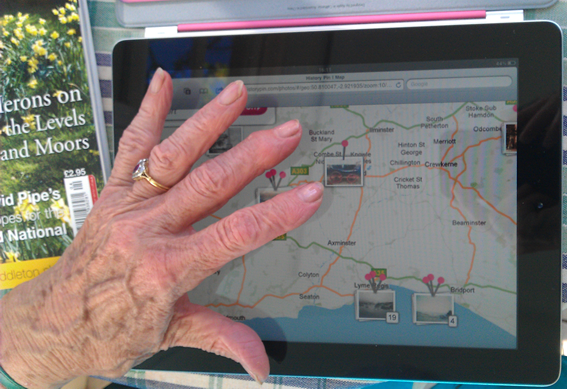 Of course, we would like to have much more mobile access around the museum. 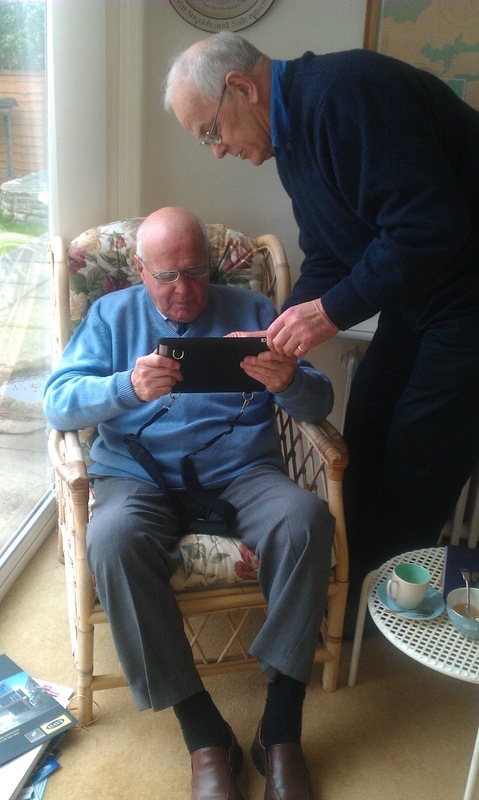 The iPad has some proven advantages for people with various types of communication and related disability, using the inbuilt Accessibility features. However, its weight, the problems of reliably touching, wi-fi difficulties and problems of aligning with QR codes mounted in the 'traditional' museum position (e.g. on an existing label), not to mention security issues, have put us off using it in this 'conventional' way. One of our next steps will be to trial a lightweight but stable trolley which small groups can take round the museum, picking up QR codes on cards and 'feeding' them to the machine rather than the other way round. We will need to chose objects for their good wi-fi coverage and physical accessibility as well as for their interest/relevance to the trail or game. We hope this way to enable visitors who find difficulty in typing (e.g. to put in an object's stop number) or reliably using a touch screen to participate in a trail and to take part in choosing what they find out about. The 'iMuse in Reading' sub-project aims to encourage people to learn more about their heritage and that of others in novel ways. We are creating a mini 'Alternate Reality Game' (ARG) aimed at families with children aged 6-13 visiting the Museum of English Rural Life during half-term, February 2012. The techniques we used were informed by a workshop at the Museum Computer Network conference in Atlanta, Georgia, November 2011. The Museum has a growing interest in promoting 'Sense of Place' and 'iMuse in Reading's' funder (Reading Borough Council through its Culture and Sport Fund) wishes to promote local people's knowledge of local history. The Museum holds an extensive collection of objects related to butter-making and runs events which include butter-making. However, Lorna's advice was that cheese had the potential to be more 'hilarious' to children. With the help of Greta, a member of Museum staff, we scanned the online catalogue. 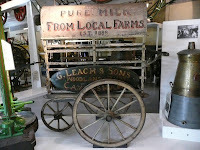 There were some striking objects with local dairy connections [e.g. cheese press, milk float] and some which were strikingly large but unlikely to have been noticed before [e.g. whey heater, milk churn]. There was also the potential for following a storyline - cheese production - though we have had to modify this slightly due to the layout of the Museum being materials- rather than process- based, and some relevant equipment being in the not-so-accessible store upstairs. Berkshire is not well-known for traditonal cheese making, but there has fairly recently been a resurgence of interest in specialist cheeses, and there are now two cheese-makers within a few miles of Reading, both making cheeses with locally-related names (Barkham Blue and Spenwood, named after Spencer's Wood). There was a further piece of context we wanted to include. The Museum has a temporary exhibition of rural photographs and has based this half-term activities around the theme of 'all things optical' encouraging visitors to investigate new 'ways of seeing'. While our other activity (Ways of i-seeing, qv) more closely follows this theme, there was potential for including a photo in the game. 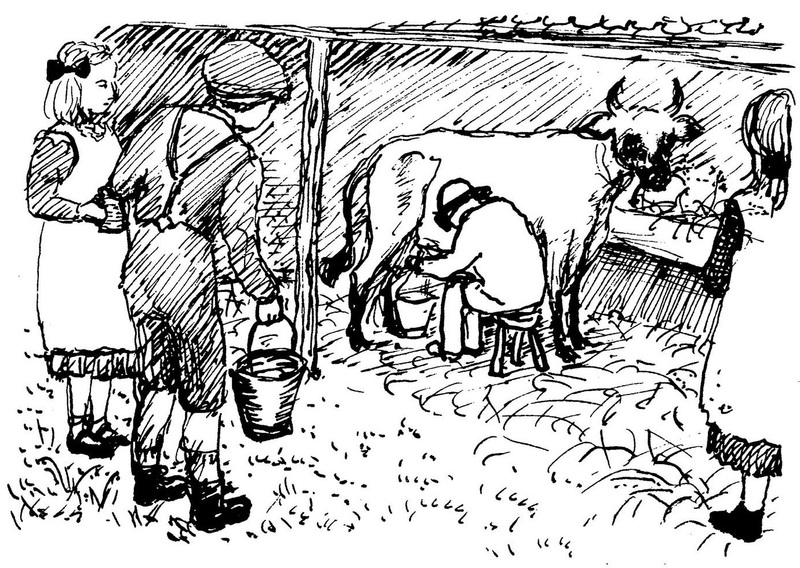 Coming away with some increased knowledge of Reading's connection with dairying and cheese-making in particular. Pongo Cheddar is professor of Food Technology at Reading University. He is short of money because he made an unwise investment in Cheesey Wotsits just before the world economy took a massive dive in 2008. For some time his colleagues have noticed his suspicious behaviour. He has been spotted observing the dairy herd at odd hours. He has been seen sneaking into the University dairy in Redlands Rd late at night. When the secret cheese formula disappeared at the same time as the Professor, Chief Inspector Mouse of Thames Valley Police was called in to investigate. However, the case completely baffled him. Cheesed off, the University called in crack detectives from Reading to help out. A forensic lab was set up in the Museum of English Rural Life right next door to the dairy. Detectives were issued with their ID cards which gave them access to the lab's patent i-nigma machine. This could analyse clues at some speed. A piece of black cloth was found. i-nigma analysed it as coming from an academic gown. The Farm Manager had spotted one abandoned near one of the University's farms. Detectives searched for it and found it hanging near an old Suffolk wagon. Looking up, they noticed this was a prime vantage point from which to view some types of animal which produced milk for cheese. They counted the types and then found another clue - bits of straw. i-nigma identified it as straw from an experimental field near where the University kept its historic steam engine. Detectives rushed to the spot and noted the words inscribed in the ground next to the cows. They found evidence that the Professor had been there, his college scarf. They also found a third clue - a sort of white splat. They eagerly got i-nigma to analyse it. 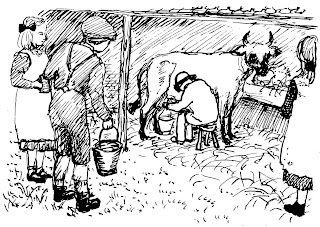 It was fresh milk from the University's dairy herd. It looked as though someone had spilt it when stealing the cows' milk. Detectives found a milk float parked outside the dairy. They noticed it came from Caversham. The Professor lived in Caversham. Was there some link? Detectives took a good look around the dairy. There were several bits of cheese-making equipment. They found the whey heater up against the wall beside an enormous milk churn. They noted it was made of wood and metal. It had been used recently. Calling in a cheese-making expert from the Food Science Department, they realised the next stage would be to press the cheese so they went hunting for a cheese press. 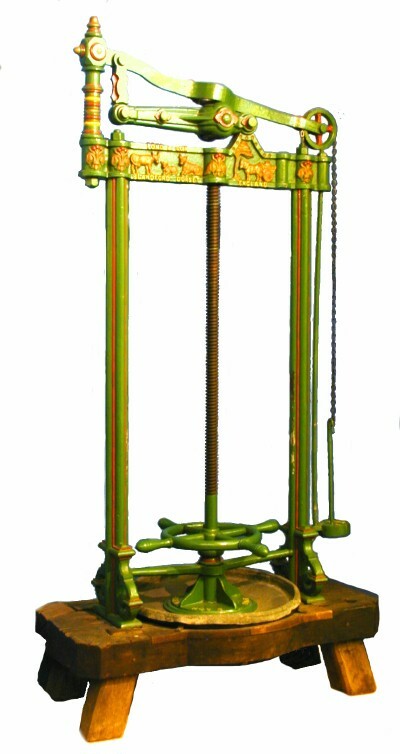 Yes, they noted that the green cheese press had been used at the University! And the Professor's mortar board was abandoned next to it. Had he been secretly making cheese from the formula? Nearby was another clue. i-nigma analysed it as horse hair. A horse and cart had been spotted leaving the dairy at great speed late at night. Was It being driven by the Professor? Searching for the cart they found it parked but no one was to be seen. However, a green welly was left nearby, and they took the clue they found there back to i-nigma. i-nigma confirmed it was mud from the welly boot and seemed to come from a farm nearby. Detectives visited the farm and discovered police photographer Justin Partyka had already taken a photo of the old pantry which contained a vital piece of evidence, a plastic supermarket carrier bag. Nearby they found a further clue, a fingerprint. i-nigma confirmed it matched the Professor's fingerprint and also had pungent cheese molecules on it. The evidence seemed to be getting stronger and stronger, as was the dreadful smell! In a small cupboard, their nose told them they had the final bit of evidence. A new form of Stinking Bishop cheese. The Professor had been in talks with supermarket giant, Tesco, hoping to make a fortune by selling the formula. His colleagues in the Food Science Department were furious as they had all worked on the new formula and were hoping to share in the fame it would bring them. Professor Pongo Cheddar was up in Reading Crown Court for formula theft and endangering public health by manufacturing a malodorous cheese. Chief Inspector Mouse retired early, too embarrassed that Reading's detectives had solved the Great Cheese Mystery where he had failed. The Detectives were awarded certificates of appreciation by the grateful University. The formula was safe again. The building which is now the Eat cafe next to the Museum of English Rural Life was part of the British Dairy Institute. This taught cheese-making, and some of their equipment later came to the Museum. The University of Reading still teaches cheese-making and maintains a strong academic interest in Agriculture and Food Science. 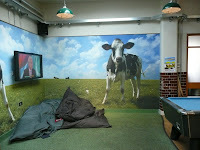 If you go to the cafe you can see milking stools and a life-size wall painting of a cow (up the steps inside the cafe). Berkshire isn't traditionally thought of as a cheese making county, but there has been a resurgence in interest in cheeses and Barkham Blue (made near Wokingham) and Spenwood (named after Spencers Wood) are made just a few miles away.